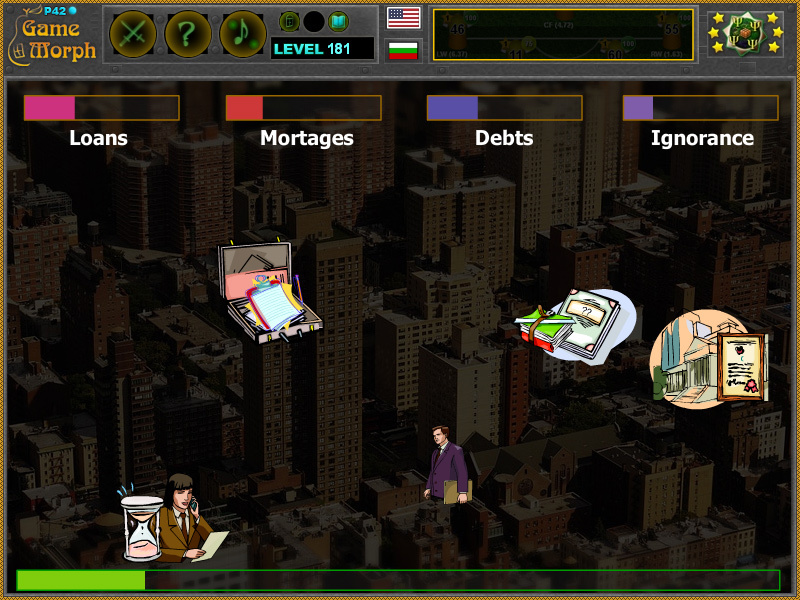 4 financial liabilities in a fun online economics learning game. "Liabilities Game" is a free online game to study bad finances and passives. Move with the mouse and avoid loans, mortgages, debts and ignorance, which represent undesirable personal finances, called Passives. Fun educational economic game, suitable for online lessons and interactive classes. Interactive finances for kids. How to play Liabilities Game. Avoid bad finances. There are 4 liabilities or passives that moves in a random trajectory on the screen. Move with the mouse and avoid loans, mortgages, debts and ignorance, which represent undesirable personal finances. If the bar of any liability is filled up you loose the game. Survive until the time runs out to win the game. Know 4 liabilities and get +1 Knowledge Level. In essence, the liability is any property from which you may lose money in the future. In financial accounting, a liability is defined as the future sacrifices of economic benefits that the entity is obliged to make to other entities as a result of past transactions or other past events, the settlement of which may result in the transfer or use of assets, provision of services or other yielding of economic benefits in the future. A liability is defined by the following characteristics: Any type of borrowing from persons or banks for improving a business or personal income that is payable during short or long time; A duty or responsibility to others that entails settlement by future transfer or use of assets, provision of services, or other transaction yielding an economic benefit, at a specified or determinable date, on occurrence of a specified event, or on demand; A duty or responsibility that obligates the entity to another, leaving it little or no discretion to avoid settlement; and, A transaction or event obligating the entity that has already occurred. 3. What are the liabilities? Labels: Arcade Games , Economics Classrom Games , Finances Games , Education Games , Free Online Games.